Lovely Things: hello there fall . . .
hello there fall . . . It is officially fall today and I'm thrilled. I love that the days are getting shorter, that means I can light candles a little earlier everyday. I love to cook in the fall and there are so many great things to cook and stew once the weather turns cooler. Or maybe it's my love of the color orange. 1. My favorite Burberry scarf in orange plaid. 2. Trade Joe's tomato soup and mini cheese panini sandwiches. 3. Arizona desert flowers. 4. My laundry room with orange and yellow kid art. 5. California sunset. 6. My sons monogrammed white shirt. 7. Butter nail polish in Minger. 8. My husbands favorite tie, Brooks Brothers. 9. Veuve Clicquot champagne. (Thank you Sydney)! this is just lovely annie. love the orange tie and the orange monogram. well actually i love it all! What a delicious collage you have delighted us with today. 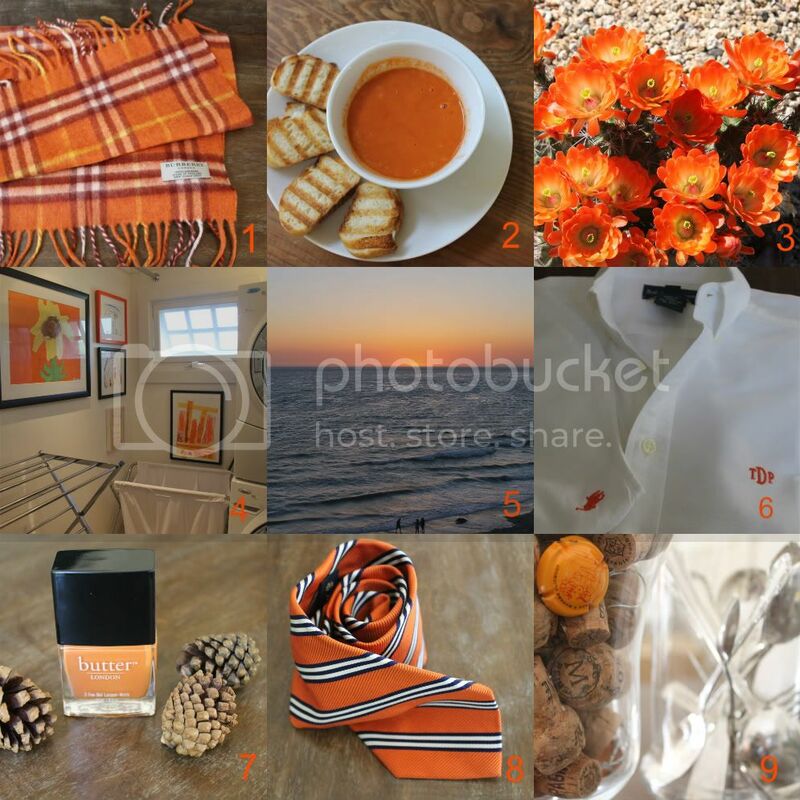 Orange zest is singing through each of your images and thoughts of home comforts and autumnal tones and tints are so appealing. We wish you a wonderfully relaxing autumn weekend! I love the orange artwork in the laundry room...I must look back and see other views of your laundry area as we are doing a reno on ours and i need some ideas. BTW that Burberry scarf is awesome...swooning form here! I love all of this! I'm excited for Fall. Love this post! Happy fall to you too! I love these color-themed posts. I want to put on the plaid scarf right now. Just gorgeous :D But I had to laugh at the orange tie ... my husband, who is colour blind, has one very like that, the problem is he is always trying to wear it with his lilac shirt, so not 'the look' for a chap in banking! i can't believe it's fall already! love your pops of orange.. Thanks so much for stopping by - orange is one of my very favourite colours, so much fresher and newer than red. Annie I love every single thing you pictured!! Especially the sunset! Love your fall round-up, Annie! So pretty! It's 82 degrees here today, so not feeling like fall, but I know it's officially here. Enjoy your weekend! What a lovely collage!! I want to learn how to do tomato soup for winter! What a beautiful series of pictures!! The orange colours are gorgeous. That Burberry scarf looks perfect for this fall. BTW, thank you so much for your kind words and the little poem!! Love this collage of photos! I actually really like the color Orange and it's making me wish fall! Just came across your blog and love it! hope you visit ours. orange ya happy it is fall....love your pics.